Thank you for your interest in my uniquely crafted hand-dyed silk ribbon. Whether you desire this bespoke touch for your invitations, floral details, photo styling, programs or other wedding details, this flowing ribbon creates a delicately romantic and distinctive touch that will last in your photos for years to come. I want you to know that I am here to help make the ribbon decision making process as pain-free as possible. I will guide you through all your silk ordering needs and help you make decisions based on your specific taste, style and budget. As a creative, I relish any opportunity to brainstorm with brides and businesses to achieve their aesthetic ideal. Hand-dying is a lengthy creative process which brings about beautifully complex results. I love creating this ribbon because each batch is a new creation, producing gorgeously different hues. There are unique touches of pigment in the form of marbling, flecks of alternate colors, and differences in tone that will yield slight variations from one ribbon to the next. Ribbons are ripped by hand to achieve subtle feathery edges. Features like these make each piece a one-of-a-kind, noteworthy piece of art. Read all about it below, and be sure to check out my gallery at the bottom of the page... so many pretties! While I keep a stock of my silk products, I operate mainly through custom ordering. I would be delighted to curate a custom batch in your palette! Whether you desire this bespoke touch for your invitations, bouquet and floral details, photo styling, business, programs, tags or other wedding details, you’ve come to the right place. Please contact me if you would like to place a custom silk order with your desired use, color palette and quantity. Please allow 3-8 weeks production time, depending on the nature of the order. Rush service may be available. I try to have a selection of ready-to-go ribbons, styling bundles & bouquet collections readily available for purchase locally for anyone who needs to feel & try before they buy, or simply for those in a last-minute pinch before a wedding! If you live in the Dallas area, I would love to meet you for a little coffee & ribbon shopping date to see my current selection in person! I strive to have fair, attainable pricing for this beautiful and sought-after product… my pricing is extremely competitive, and most likely the lowest you will find! Please shoot me an email to request a pricing guide or do so via the form that you will find at the bottom of this page. *Please note that pricing fluctuates due to the fluctuating cost of silk. Florists + Wedding Venders enjoy 5% off all orders! As the demand for silk ribbon among brides continues to rise, allow Oh Be Joyful Creative to help you stock ribbon in bulk at your floral shop, as well as create custom batches for your upcoming weddings. Florists enjoy discounted ribbon, table runners and styling products and may customize sizes. Bouquet Collections are hand picked sets of silk ribbon, curated to make your bouquet ribbon selection quick and simple. Long flowing ribbons cascading from the bride’s bouquet curate a delicate touch that will be enjoyed in photos for years to come. Petite versions may be made for bridesmaid’s bouquets, groomsmen’s boutonnieres and other floral elements. Featuring complimentary hues and varying textures, there are three tiers available to suit each bride’s taste and budget. Custom bouquet collections are of course available. Silk ribbon styling bundles can have any number of ribbons within them, and colors can be grouped in various ways, depending on your budget and desired look. A Mid-range Styling Bundle is the perfect blend of hues and textures for work on a styling board. For a complete set, I suggest a cluster of ten one yard ribbons, with up to eight ribbons in varied widths between 0.5” and 1.5”, complimented by two wider 2” – 3.5” neutral ribbons, one in original or charmeuse silk, and one in crinkle or gauze silk. Colors & hues will of course vary, but include a mix of blushes, blues, grey & neutrals. (These tend to be the most “bridal” colors, however I am able to make just about anything.) 1-2 wooden spools may be included. Mini Monochromatic Styling Bundles might include four to six ribbons in a monochromatic palette (i.e. blush tones), with most in varied widths between 0.5” to 1.5”, complimented by one to two wider neutral ribbons in original or charmeuse silk. Include one spool, and fold the rest, tying each with thin strips in the same color, or leave them wild in a pack! In addition to the blushes, blues and neutrals, this type of bundle would also work well with a “modern” palette with white, black and grays. These, of course, can be larger to include more colors and textures, or smaller to give you a starting point. Let’s discuss ideas to figure out what works best for your purposes. Depending on the nature of your order and what additional jobs I have in the works, please expect a 3-8 week turnaround from the time of deposit. Anything less than 3 weeks is considered rush and may incur additional fees. That said, let me know when you need it and I will do my best to work with your needs! Processing time on out of town orders is 3-5 business days for existing product, and of course the processing time is as stated above for custom orders. Please let me know if you are in a rush and I will do my best to accommodate. Each ribbon will arrive wrapped around a wooden dowel or spool, as pictured, based on the width of the ribbon. I recognize that a good looking spool can have a big effect in photos, therefore I am happy to add additional spools to your order at a low cost (based upon availability). Due to the individualized nature of hand-dyed ribbons, each batch is distinctive and colors in one dye bath will never be precisely the same as the last. Therefore, I am not able to offer specific color samples at this time, however I am able to send those desiring to spend over $75 a swatch in each type of fabric so that you may touch, see and feel it. Neutrals, blushes, blues, dusty blues, charcoals and other grays tend to be the most “bridal” colors, however I am able to make just about anything. Let’s talk about what palettes will best suit the needs of your buyers. Once dyed, you may notice distinctive touches of pigment in the form of marbling, flecks of alternate colors, and differences in tone that will yield slight variations from one ribbon to the next. Features like these make each ribbon a noteworthy piece of art. Ribbons are ripped by hand to achieve subtle feathery edges. Each ribbon is one-of-a-kind! 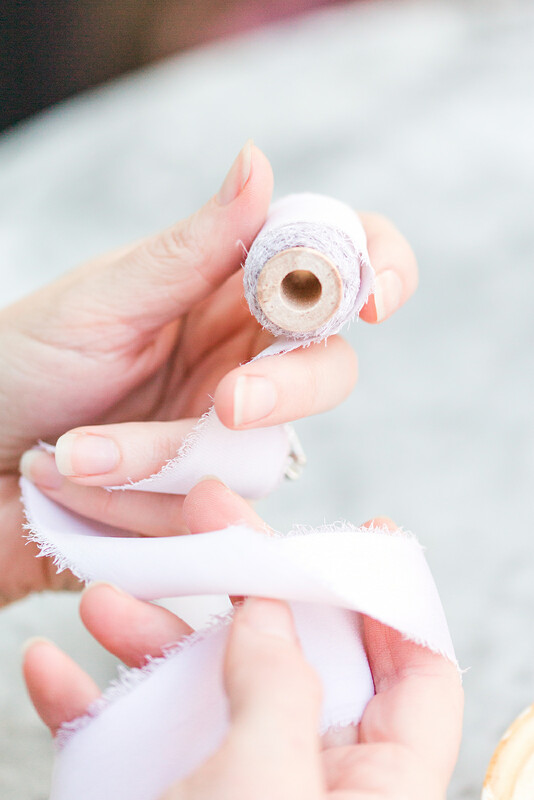 If your ribbon needs freshening, I suggest pressing it with an iron on the silk setting, or if you happen to have a hair straightener handy, you may use it on the highest setting. I have found that a conventional iron has better results than a straightener. For stubborn wrinkles, use water. As silk is a delicate material, take care while ironing. If any threads from your hand-torn ribbons come loose, not to worry! Simply snip the wayward thread, or if you do not have scissors at your disposal, gently continue to pull the thread out and you will be good to go. As our ribbons are hand-ripped, measurements are approximate.